Was it a beautiful day for you too? It was absolutely gorgeous here in southern Manitoba. About 20 degrees C, a slight wind and SUNNY! 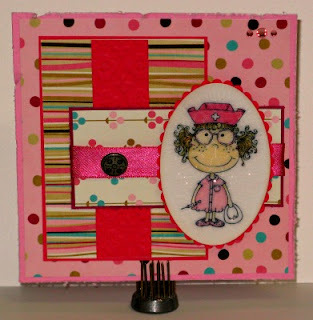 Today I'm going to show you a pink card I made this weekend. It's distressed in a couple of ways. Since I can't find my distressing tool (where do these things hide anyway?!) I used the edge of my scissors to distress the edges of the card. I also sponged some of my TH distress ink onto the edges of my image and once it was colored, I added some glossy crackle to it. I left it to dry overnight and when I saw it in the morning, I was so upset. It was all curled and ugly looking. I managed to salvage it though, by pressing it under some heavy books for a day. That's a good tip for me to remember for another time. The image is a Prairie Fairy image--Nurse Gillian. Thanks for sharing at Let’s Ink It Up’s *Think Pink* challenge. PS* I have some candy up for grabs at Creations LaDiva :) Hope to see you there ! The image is adorable and love all the layers on your card! How cute, love the image! Oooh Janet, I love your super bold bright papers, they are so cute and fun, thanks for joining us at Prairie Fairy Fridays and good luck!